Santa Rosa, CA On Thursday, September 13, 2018 at approximately 5:43 p.m., the Santa Rosa Junior College (SRJC) District Police Department contacted Marcus Len Walton, an 18-year-old Santa Rosa resident, between the Frank Doyle Library and the Bertolini Student Center on the Santa Rosa Campus. District Police were actively looking for Mr. Walton since September 11, 2018 regarding suspicious activity on campus. On Tuesday, September 11, 2018 at approximately 3:33 p. m., the District Police Department was alerted by a faculty member regarding a young male “aggressively flirting” with female students and making them feel uncomfortable. The male was seen in and around the classrooms and quad areas of Shuhaw Hall. District Police responded and searched the area but were unable to locate the unidentified subject. On September 12, 2018 at approximately 5:12 p.m., District Police responded to a call of a young male subject harassing a female student in the Frank Doyle Library. It was reported the male walked up behind the female and said unwanted things to her in an inappropriate manner. Once again, District Police responded but the subject had already left upon their arrival. 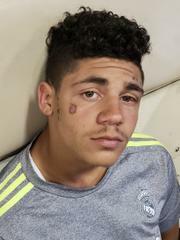 On the afternoon of September 13, 2018 District Police were able to identify the subject as Walton based upon a social media alias and facial tattoos. He is not an SRJC student. Due to his behavior on campus over the previous days, District Police continued to search for him. Later that afternoon, District Police Officers spotted Walton between the Frank Doyle Library and the Bertolini Student Center. After questioning Walton regarding the harassing behavior and considering all known information at the time, officers determined he was not being of good conduct and was in violation of his current pretrial court terms in Sonoma County. Marcus Len Walton, was arrested for section 1203.2 of the California Penal Code (Violation of Pretrial Release). Walton was transported and booked into the Sonoma County Jail without further incident. Due to the fact that Walton disturbed the orderly flow and operation of campus, he is not authorized to be on any SRJC District property for the period of seven days per 626.6 of the California Penal Code. This is an ongoing investigation and District Police are asking anyone who was approached by Walton or anyone with additional information regarding this case to contact the SRJC District Police Department at (707) 527-1000.